Just a quickie from me today – I’ve got a little free time here at the end of the day, and in this ocean of a busy week, tonight’s got knitting written all over it – I’m on a roll – there’s so much knitting going on. Heaps of it, things falling off the needles – that magnificent cowl is finished (I’ll show ya later) and that sweet pair of Wild Wolves, knit for Meg. This was a super fun knit, and very quick, just an evening for each of the pair, if that, and I made only one change to the pattern. There’s two rounds on the foreheads of the wolves that have three colours per round, and I gave that a resounding nope. I used the two colours (background and light grey) for those rounds, and then began using background and dark grey when it was those two colours per round, leaving a long tail both when I started the dark grey, and when I ended it. When I was all done I went back and used the tails to duplicate stitch on the few stitches in the rounds prior that needed to be that colour. Easier for sure. *Really, I can look it up, but what’s the point of having the blog in my life if you aren’t one enormous brain trust. PS. The mittens aren’t just good looking, they are Elliot Verified Delicious. This entry was posted in Uncategorized by Stephanie Pearl-McPhee. Bookmark the permalink. Very important to have your knitting delicious. Maybe a little “essence of sheep” got left in the yarn when it was being processed? Unfortunately, I can’t remember the trick for the French knots either. If Elliot made the wolf’s eye disappear, he’ll be pulling rabbits out of hats in no time! Adorable wolf pup! And he has good taste! When I do the knots, I slightly split one of the plies of yarn on the way up and another (on the other side of the stitch) on the way back down so that the knot looks as if on the right side and hides the split yarns. Also, I tend to use a candle-wicking knot (figure 8 vs. the twist of the French knot) as it is just a bit bigger to stay put. This isn’t likely what one would find if looking up French knots, but it’s worked for me for years. Exactly — good, effective tactic, well explained. Thank you. I’m sniffing that sweet baby head in my imagination. Thanks! I was just about to! I’ve always read stories of human babies being raised by living creatures like wolves. Now I know some of those stories must have been true! I like the squinty wolf! He looks like he is being sassy. I would forget the French knots, and just stitch eyes in, like I do on my teddy bears. You can make them several layers “deep”, if you want them to stick out more. As Elliott loves them (obviously, he prefers wolves to rabbits), they might be more secure. The mittens are delightful. Perfectly adorable! What if you bring your needle up on the left side of the eye stitch, wrap your French knot around the needle, then put your needle down in the right side of that same stitch (straddling the stitch horizontally). Those are perfect baby toys. Hands go in them. Hands come out of them. Hands go through them. And they have faces, animal faces. Perfect. I don’t think that Eliot understands hand knits that aren’t for him! You’re going great, KnittyGram! Really intrigued by the use of Duplicate stitch to simplify that one round in the wolf design. Leave it to YH not to make more work for herself than is necessary to get the job done! Audiobook suggestion (can’t log in to Twitter somehow): go to Librivox.org, then find a solo work read by Elizabeth Klett (she once had a knitting blog, was it blue garter?) and enjoy. Supported! And I highly recommend solo works read by Karen Savage. I agree, Karen Savage reads so well. Can recommend The Railway Children, excellent even if you have seen the movies. I’d also ditch the knots, and use a couple of green or yellow beads for a nice, predatory look. You could just do crossstitch in stead of french knots. I would I think. If not I would go for beads. I’ve seen several articles and television programs in recent months speculating about the “hive mind” that might exist in the future and every time I do, it occurs to me that the knitters have already established the hive mind mentality. Obviously Eliot needs a wolf hat. Wolf booties, too. Go Elliot, all Wolfie all the time! Anchored French Knot: Thread needle with yarn. Bring the needle up through the work from the back to the front and then push it back through the same point and out again one stitch away from the original point, leaving a little loop. Push the tip of the needle through this loop. Wrap the thread around the needle tip three or four times depending on the thickness of the yarn. Pull the needle through then push it back down through the work. Adorable! I have no tips for the embroidery, alas, but I can see others have made good suggestions. Very sweet. Your blog posts are such a highlight in my week. Thanks for sharing all that you do! You could just call them Winking Wolves Mitts! 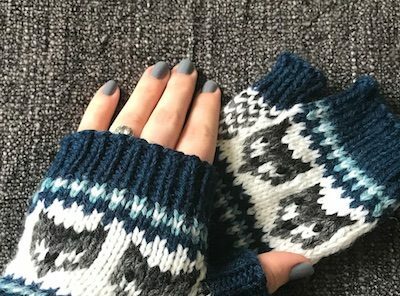 Love the wolf mitts! I’m not on Instagram, but saw your comment about suggestions to watch while you knit. Have you tried watching Stranger Things yet? I have, we loved it. Good suggestion! I have been binge watching Midsomer Murders on Netflix. Over 100 episodes and almost 2 hours per episode! DCI Barnaby oozes sarcasm. Isn’t Franklin Habit a great authority on embroidering knitting? He might have good suggestions for anchoring french knots! 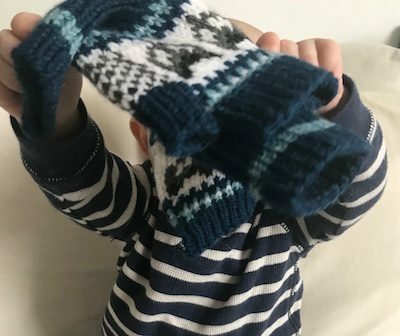 The mitts are gorgeous, and I’m glad they’re Elliot-approved. of all the things I’ve done and (mostly) done well in the fibre world, french knots are not it. For some reason, I can not make a french knot. I’ve tried with many fibres, many instructions….just.can’t. do. it. so no help from me, but these are adorable!!! Please, no beads for now. Age three at minimum. Tie a nice knot in the yarn to stitch in place. If you slip the beads over the stitch and knit them in, they’re perfectly safe. No way to get them off, unless you break the bead or the yarn. Most instructions say to pull the yarn through the bead with a crochet hook, but I can never find one fine enough to fit through the hole. I use a piece of fine craft wire folded in half for a needle. currently knitting the cat version. I considered ditching the knots and going with duplicate stitch. Thanks to video linked above, I may forge ahead & try knots! Happy knitting! Candlewick knots are also called colonial knots and I like them better than French knots if I can remember how to do them. The trick with either is not to go down in the same hole: come up on one side of the stitch, make the knot, then go down on the other side of the stitch (or one leg of the stitch, or split the plies). Same rule applies if you are making them on fabric. Very annoying when they pop through to the back. I assumed that was the gnarly old grandaddy wolf who’s seen a thing or two in his time and has the scars to show for it. No one seems to mind or notice an absence of eyes. I advise against beads, though – they can be too delicious. They look fun, beautiful, and WARM! And thank you for the suggesting on making that kind of colorwork easier! Beautiful!! With or without the full set of eyes (I would plump for the ‘scarred old wolf’ explanation offered above). I’m getting a huge amount of vicarious pleasure out of them, since I haven’t had time to knit for about a week (gulp!)! The horror of it …. 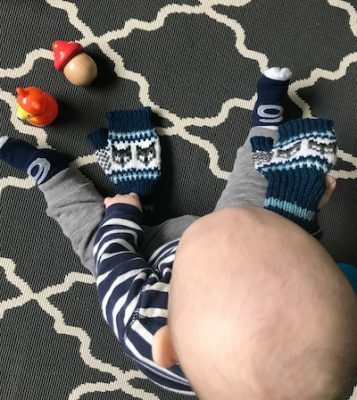 Just a thought…mightn’t Elliot need a wolf hat to match his mama’s mitts? So, so good! My daughter works at a summer camp where all of the counselors take names other than their own (my daughter’s is Silver Blaze and the resident New Zealander took the name Kiwi, you get the deal). Anyway, the camp owner has a little boy and his nanny’s camp name is Wolves. So, he is also being raised by Wolves. Totally cracks me up! I’m not on Twitter, so I’ll leave my audiobook recommendations here. If you haven’t checked out the CraftLit podcast yet, please do! Heather has been keeping me busy listening to the classics for over 10 years. She started out using the Librivox books, but has developed her own cast of readers that are fantastic. 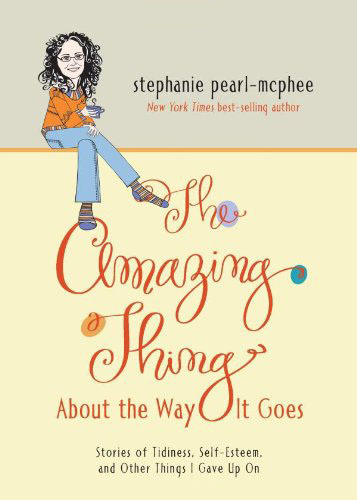 She provides great background info and a mini-lit lesson (without the pop quiz) along with the weekly chapters. I’ll second anything read by Karen Savage or Elizabeth Clett, too – between the two, they’ve read all of Jane Austen’s novels on Librivox and I listen to them over and over. I love listening to the Patrick O’Brien Aubrey/Maturin series on Audible, as well as the Sookie Stackhouse series (basis for True Blood) by Charlain Harris. I also listen to a lot of autobiographies. Anything by John Scalzi, if you like sci-fi. Ready Player One if you’re a child of the 80’s. I echo the love for the Aubrey/Maturin books, although I only read them, never listened to them. But now I have a sudden desire to listen to them while knitting! How about knitting in beads for the eyes? Here in the UK we have a brilliant journalist called Caitlin Moran. She wrote a comedy series called “Raised By Wolves”. Worth a look I’d say. Aww, I thought the wolf was winking. That wolf is winking! When needlepointing, I frequently lose my french knots, so when I need them, I do an extra wrap per french knot and I don’t go down where I came up. I’ll be honest. When your mum died, I was so shaken by it and had so many memories of my mom’s passing, I gave up reading for a while. It was emotionally devastating for me and every thing you felt, I was empathizing with to a huge degree. Now that we are back to Elliott and Luis, I am good. Be the nana-cam! I am with my grands. I post photos all over IG, Ravelry and FB – with permission of course. Stories happen all the time. Bottom line, when we are raising our children, we are so busy raising them we don’t get to enjoy them as much. The grands are pure enjoyment. We don’t worry about the fact that all they ate at our house is chips and chocolate. That’s for their mum to worry about. Want to set off fireworks? Sure. We’ll go do that. Want to build a tent over the dining room table? No worries! Reading the same book 25 times. I got this! It’s all about the fun. I’m sure you had lots of lovely and helpful comments about the French knots. This isn’t one of them. I’ve never been successful at French knotting. 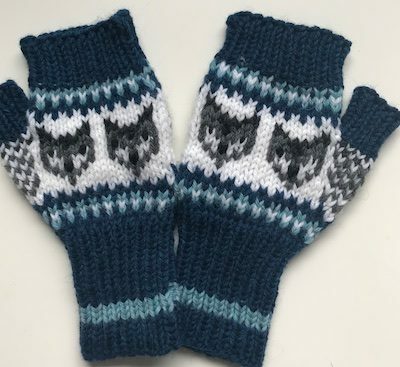 But the mitts are lovely, with or without one of the eyes. I can see it coming. “This knit ranks high on the EVD scale.” The new measure of a project. Yes, yes the knitting is amazing (as always), Elliot is adorable but what really impressed me was that Meg has such a great manicure! As a new mom that is an impressive feat! Raised by Wolves! Hahahahaha I am breathless! That will be my go-to thought when I need a lift for the foreseeable future. That and your wicked yarn bowl in next post. Things are very open and intensely clear explanation of issues. was truly information. Your website is very beneficial. oh wow. Thats perfect gloves. No appearances scheduled at the moment.